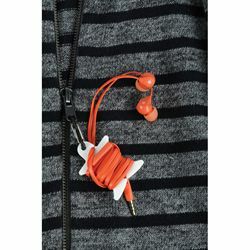 Use the Curvyman to organize your earphone cables. Just wrap the cables around his narrow but rigid waist and snap the ends into the retaining slots. Then use the included mini-carabiner to clip Curvyman to your key chain, backpack or zipper pull. Earphones not included.